Old Home AC * No trip charge for any repair over $150! Call for heating experts today. If you have an old home, servicing your air conditioning may require special knowledge and skills that not all HVAC professionals possess. It is important to find a service person who has worked with older home air conditioning units. Thankfully, at Global Heating & Cooling our entire team is highly-qualified and ready to help! If you recently turned on your air conditioning in your home for the season and found that it is not working the way it did last year, don't worry! Global Heating & Cooling can help you diagnose the problem and come up with the best solution. Common air conditioning problems include leaking refrigerant, fan malfunction, a frozen coil, thermostat problems, or power supply issues. Most of these issues are a relatively easy fix. If we find that your system is beyond repair, we will help you navigate the next step. When replacing or installing a new air conditioning system in an old home, Global Heating & Cooling can serve as your installation team! Below are two options to consider that do not involve significant construction. Ductless Mini Split Systems - These are often installed when tying into existing ductwork is not practical, or if ductwork is non-existent. A mini split system involves installing individual units in each room that you wish to have cooled, and then connecting these units to an outdoor compressor. At Global Heating & Cooling we have significant experience installing ductless mini split systems. The Unico System - These systems utilize unique modular coils and air handlers that are much smaller than traditional ductwork - allowing these systems to fit into small spaces such as wall cavities, ceilings, closets, and crawlspaces. We are currently running a special offering a free trip charge for any customer that spends $150 or more! 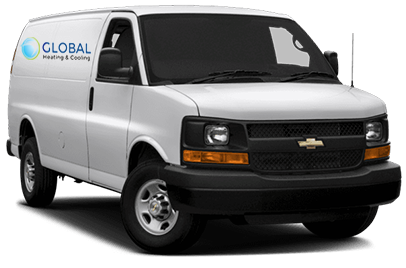 Contact 773.501.0873 to speak with someone at Global Heating & Cooling.